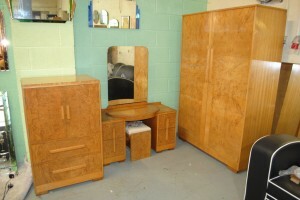 An original Art Deco 4 piece bedroom suite comprising of a Tallboy, Dressing table with Stool and Wardrobe. The Amboyna and Walnut look beautiful! 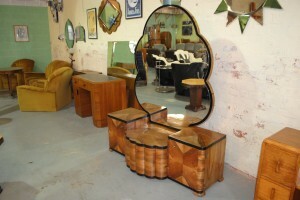 This suite can be bought as it is or could be stripped, polished and stool reupholstered. For more details please call 01257 473688. 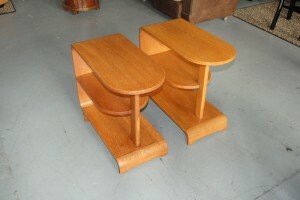 We are often asked for a pair of original tables so I am pleased to offer these, they are a very nice shape and design and in excellent condition. For more details please call 01257 473688. 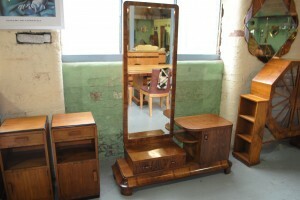 An original art deco walnut dressing table with tall mirror and very handy storage. In fabulous condition, great shape and wonderful veneers. 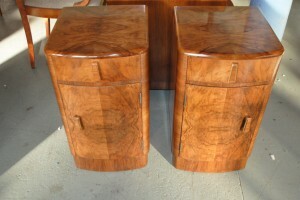 A true matching pair of English figured walnut bedsides in A1 condition. Beautiful standout dressing table with exquisite veneer work all round. Fluted curved centre doors and 2 outer doors allow plenty storage space. Fully refinished and looking great. For more details please call 01257 473688. 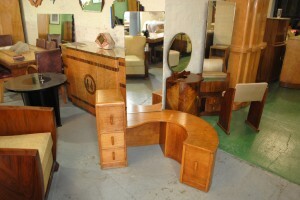 A fantastic original art deco 3 piece birdseye maple and walnut bedroom suite. 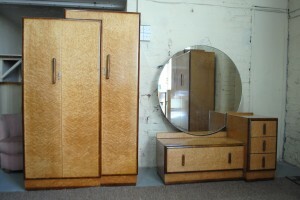 Comprising of a Ladies/Triple Wardrobe, a Gents wardrobe and a dressing table with a huge circular mirror. 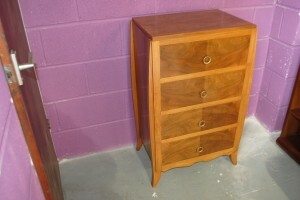 Great quality furniture that has been fully repolished back to its former glory. I’m really struggling to photograph this one and my pics don’t do it justice, the finish is beautiful. Some great storage and features inside like a secret lockable compartment. These are usually tucked away in the ladies wardrobes somewhere, but not this one ! Makes a change. 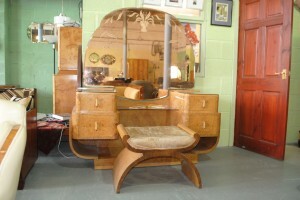 Original Art Deco Dressing Table, fantastic shape and design features! A fabulous original art deco dressing table with wonderful design features, just take a look at the photos .The beautiful curves and shapes and the way the seat slides in and out are are just a few of the features that make this piece so special. There’s a Secret storage compartment within the concealed seat and a make up drawer in the top pull down cupboard with 2 more handy drawers below. All finished in oak veneers. 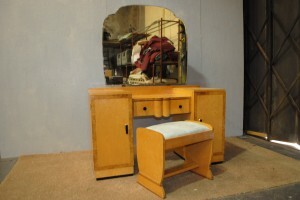 A lovely original art deco dressing table with matching stool and tilting, bevelled mirror. This piece will be fully refurbished and the stunning Birdseye maple and burr walnut with look amazing once again. 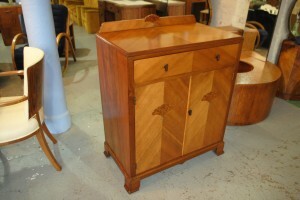 With a centre drawer and 3 more at each side there is plenty of storage!. For more details please call 012557 473688.